So what exactly is affiliate marketing anyways? This is one of those questions that gets asked a lot and there are almost as many explanations or definitions for it as you could imagine. Everyone has their own spin or perspective – their own twist on it if you will. My goal is to give you the most clear cut, straight answer to every detail, every section, every little question that might come up so that you know the full story. I’m going to give you these answers based on my personal experience as well as the knowledge I have of watching other affiliate marketers try to make a living doing it. It’s important to note that not everyone who tries to be an affiliate marketer is successful. Far from it actually. The truth of the matter is that most people fail at it sadly and it’s not because they didn’t try hard enough. The fact is that this is a hard business to crack and really become successful in. It takes specialized knowledge, a lot of long hours and almost god-like dedication to it before you can really get into the upper levels of it as a career. That having been said, there are some guys and girls that walk into it and are instantly successful. That does happen. It’s not the normal situation, but it is possible and isn’t ‘Unheard of.’ But before you get going too much on the pipe dream of being able to work from a sandy beach anywhere in the world, I did at least want to let you know that the reality is that not everyone is cut out for this business. So with that in mind, let’s get started shall we? 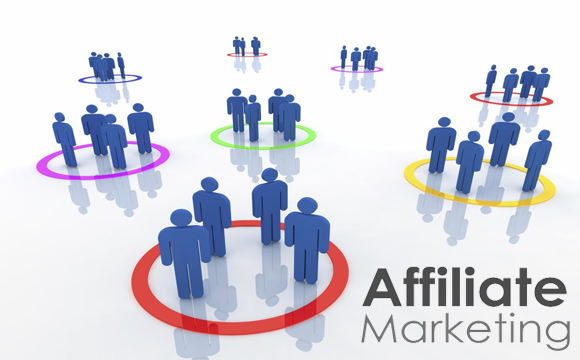 Affiliate marketing is the process of selecting a product or offer and promoting it to an audience. If people in that audience either buy the product or use the offer, you are paid a commission for your work. It is one of the most popular and widely successful ways to legitimately make money online from the comfort of your home. To example this another way lets say that you have found what is known as a ‘CPA Offer‘ that is sending people free makeup in exchange for their email address and shipping information. For every person that decides to participate in that offer you will make a $2.50 commission. You would sign up to what is known as an ‘Affiliate Program’ and they would give you want is known as an ‘Affiliate Link.’ An affiliate link is simply a link that people can click on that will track your sales for you so that the affiliate program knows how much to pay you. You could then take your affiliate link to post it on Facebook for your friends. Your friends may love the offer for free makeup and for each one that signs up, you will earn $2.50. If some of your friends decide to share your link and other people that see it sign up as well, you would earn $2.50 for each of them as well. Given how much people love to share great free offers like that on social networks like Facebook, Twitter, Pinterest and Instagram – you can see how it could go viral and end up making your thousands of dollars by the time it was all said and done. That of course is just an example of one offer. In reality you can promote as many offers or services as you like to make the most money possible in the least amount of time. Conclusion: Affiliate marketing to promote a company’s product and service in exchange for a commission on each sale. You can promote as many products and services as you would like to earn the most money possible. One of the questions that new comers will often as is whether or not affiliate marketing is worth it – being the time and effort they need to put into it to make money. As I described above, yes it is worth the effort – but that doesn’t mean it is easy. It is still hard work that you’ve got to put into it to get the best results possible. When you are just starting you are going to end up putting a lot of work into learning the business and the vocabulary that surrounds it. There are a lot of terms and phrases that you will end up having to look up so that you clear on what they mean and more importantly, what the mean to your business. After you learn the vocabulary that goes along with affiliate marketing, you will have to spend some time learning how to select affiliate offers as not all offers are created equal. Just like anything else, some things are better than others and when it comes to all of the products and services out there that you can promote – it is no different. Some products sell better than others and some offers convert better than others. So one of the first skills you will need to learn is how to pick out the best products or offers – the ones that will make you the most money for the time that you put into promoting them. After that you learn how to pick a good offer, you will then need to learn how to promote it. There are hundreds, if not thousands, of ways to promote offers. In fact, there really is no limit beyond your imagination. Above I gave one example of how you might promote a great free give away offer on Facebook, but that is really just one easy example. You could also run a blog or website, you could run pay-per-click ads on Google, Bing or Facebook. You could build a list of email addresses for people who would love that kind of offer and promote it by email it out to them. While there is no limit to what you can do, normally people learn a system or method and stick with it. It’s the most tried and true way to start affiliate marketing successfully and once you are comfortable with that system you can then branch out and experiment with new promotional marketing methods. Conclusion: Yes, affiliate marketing is worth it but it will require some time, work and dedication to really understand how to do it successfully. The next major question commonly ask is if it is profitable and if so, how profitable is it exactly. The answer is yes, it can be extremely profitable. There are affiliate marketers that make well over $100,000 a day! However, that is not the normal scenario. Most affiliate marketers struggle to make $100 a day at first. As covered above, this is typically not a business that you just walk into and are instantly successful. It takes a lot of hard work, dedication and commitment to really reach the upper tier’s of the industry. Of course, once you are there – there is no other business in the world that you would rather be in. Affiliate marketing can provide the kind of care-free, worry-free, stress-free life style that people dream of – it’s just not easy to get there. The bottom line is that if you are someone who is willing to really work hard and learn the ropes from the ground up then this is an amazing business full of wonderful people and yes, you can make a lot of money doing it. Conclusion: Affiliate Marketing can be incredibly profitable but you do have to put in considerable time to learn it. Ultimately determining how much effort is required will depend on the individual and be a case-by-case basis answer. As some people are much more able to adapt and learn certain skills quickly, others require more detailed explanations, assistance and time when attempting to learn these new skills. Because we all learn a bit differently, it really isn’t possible to put a value to this answer as to how much effort you will need to exert to be successful in this business. With all of that being considered, the bottom line is that once you do learn the skills you need and apply your talents you can make an incredibly amount of money much more quickly than you might realize. There are plenty of stories out there of unknown and struggling affiliate marketers waking up to thousands of dollars in their affiliate accounts because of one simple thing they tried, or some method that they changed. Conclusion: While the amount of individual effort may vary, it is possible to earn enormous amounts of money quickly through affiliate marketing. Because of that, even if you need to use a little more effort than others it may still be very worth while for you to pursue. There are some folks that treat affiliate marketing as a hobby that they do just to earn a little extra pocket money and that is fine. Most seriously successful affiliate marketers however treat it very much like a serious business. The fact is that once you realize just how much money you can potentially earn as an affiliate marketer it only makes sense to treat it as a business. For most people that means getting up early and working long hours, just like it was a real job that they went into every day. Of course, the two advantages of doing affiliate marketing as a business is that you can work from home (or a beach) and you can also earn much more money than what most small business will typically earn. But that having been said, there is no reason that you can’t just treat this as a hobby or something you do in your free time. It can even be a second job for you to help you make ends meet if that’s all you want it to be. Conclusion: Affiliate marketing is a business to a lot of people but that doesn’t mean it has to be one. It is also something you can do part-time and at your leisure if you would like. In my opinion, yes affiliate marketing is a great idea – even if it’s something you only try for a brief period of time. I don’t know of any other single business opportunity out there that can pay as much money for doing so little work – and on top of it if you are really gifted at it you can make absolutely life changing money by doing it. When you consider the potential opportunity it present then yes, I would say that affiliate marketing is a great idea. However, that doesn’t mean that you won’t have to spend the time learning it and practicing your new skills. While some people understand it instantly and seem to experience success on the very first day, this isn’t true for everyone. We are all a little different and for the majority of people it will require time and effort to really experience notable success. Conclusion: Affiliate Marketing is a great idea but requires time and effort to learn properly. With that understood however, it also isn’t hard work. It’s not as if you are digging ditches or doing heavy lifting and manual labor. For the most part you will simply be sitting at your keyboard and writing. If you have a skill for graphical design you may be making banners or images to help promote a product or service. Either way, it’s not something that requires a huge amount of strain on your part. Typically this isn’t anything that requires physical exertion. Beyond that, once you have learned a skill or method that works, then yes it is a pretty easy business to be in as you will often just be scaling out your operation to other advertising avenues or promoting different products in the same way that you’ve already had success with. Conclusion: While not simple, yes affiliate marketing can in fact be easy. It is normally just a matter of learning a method of system for doing things and repeating it to earn the most money possible in the least amount of time. Yes, affiliate marketing is legal. While there are some people who do promote products or services unethically the average affiliate marketer is well within their state and federal laws and doesn’t have anything to worry about. In reality, affiliate marketing isn’t that different from commission-based sales. All you are doing is suggesting a product or service to someone. If you do a good job of it and they buy that product or service, you are simply earning money for the work you did. There is no fraud or scam involved when you are affiliate marketing like a normal marketer. Ultimately this business will be as legal as you make it and allow it to be. If you do decide to do something outside of the law then you are taking your own individual risk but that doesn’t have anything to do with affiliate marketing itself or it’s legality. Conclusion: Yes, Affiliate Marketing is legal. There are some serious benefits to learning how to be an affiliate marketer and pursuing it as a business or hobby. First of all you can do it just about from anywhere that has an wifi signal. That may mean your home, your kitchen, your bedroom – where ever your are comfortable working. That might also mean a hotel, a beach, a coffee shop or a foreign country while on vacation. Affiliate marketing can provide you the freedom to pursue a lifestyle that you really won’t and in all but a few cases isn’t restricted by your location. If you have ever heard of the guys that walk into a coffee shop for a half hour every morning and make $1,000 or more a day – they are probably successful affiliate marketers. Very few other businesses provide you this kind of opportunity. Secondly, affiliate marketing can make you an insane amount of money very quickly. If you recall above, I gave you an example were some affiliate marketers earned $100,000 a day or more. While that isn’t the common scenario, it is possible to do. It’s an opportunity that very few other businesses or hobbies can provide. Conclusion: Between the freedom and the incredible earning potential affiliate marketing has unique benefits and is unlike many other business out there today. In my opinion, yes it is an excellent way to make money. Like we talked about above, you can do it from just about anywhere. You aren’t restricted to going into some boring office and dealing with a boss that you can’t stand. At the same time, you can earn a living that might not otherwise be possible any other way. Additionally, while some skills are extremely helpful to have before you start – almost everyone has an equally shot of being successful if they are willing to learn what they need to know. Conclusion: Yes, this can be an excellent way to make money, whether it’s just a little extra pocket money or as a full time job. Hopefully you will have learned quite a bit in this article and can now go out and figure out if this is something for you or not. If you have any questions don’t hesitate to let me know. I’ve been in the business for 7 years and wouldn’t replace it for the world. It’s been a phenomenal opportunity for me and I have truly made life changing money by being in it for as long as I have. I had a bit of a rocky start, so I know what it’s like to be new and confused by it all. The truth of the matter is that most of us start there, in that very place where we aren’t sure what exactly we are doing – but we do know that we want to change our lives forever. That is exactly what is possible with affiliate marketing and if you have the guts and determination to learn what you need to know and get to where you need to be – you may just surprise yourself, and everyone around you as well. Ask Yourself: Wouldn’t it be nice to be that person that everyone talks about and wonders how we makes thousands of dollars a day by writing a few emails and checking on a few websites? You know it would be and you can be that person… Stick with it, no matter how hard it gets and we will soon see you on the other side.